What's Mummy Up To ...: I HAVE been sewing ... Here's the proof! 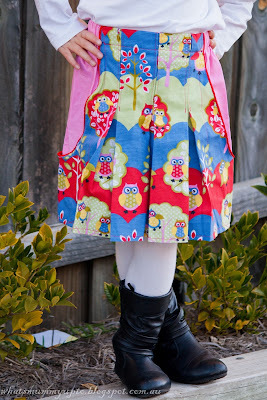 This "hoot" skirt, as Bethany and I have named it, was made using the free Pleated Pocket Skirt Tutorial from Me Sew Crazy. 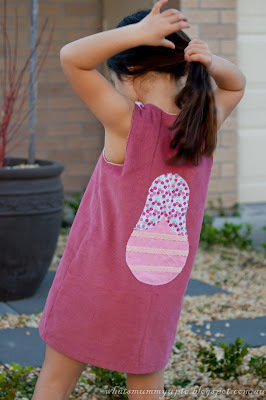 I thought it was a cute design, and loved the pocket idea ... plus I'd never made anything with pockets like this before, so thought it was a good up-skilling project. Bethany is pretty fond of this little number too ... and boy she's working that model pose in these shots! Funny girl!! I did have to fiddle with the dimensions a bit to adjust the tutorial measurements to fit Bethany, but it worked out OK! 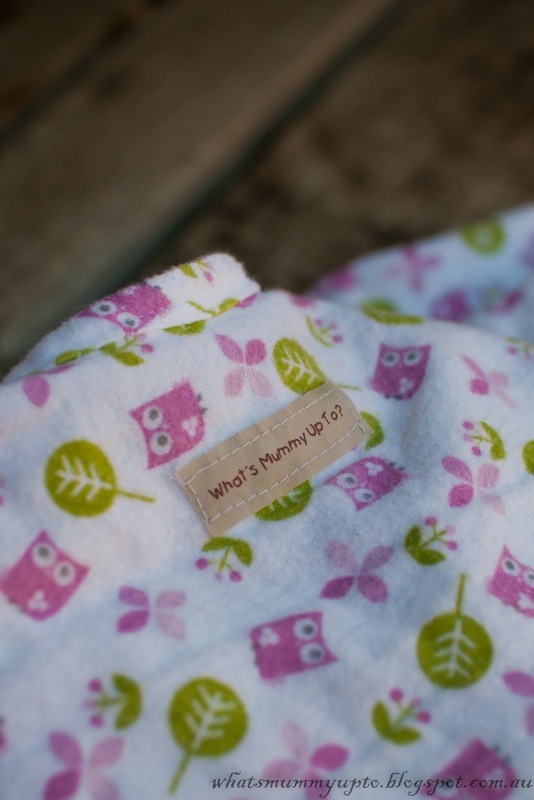 Oh, and do you recognise this hoot fabric? It's the leftovers from when I made the Change-mat for Little Bots. I love when I find enough left over fabric for a whole new project! Next was this gorgeous little pinafore for Hannah, made using the free tutorial and pattern for the Toddler Dress with Peter Pan Collar by Small Dream Factory (who can say no to a free pattern!). I've had this heavier-weight cotton fabric in my stash for a couple of years, but just haven't been able to place it with a project idea in my mind. But when I came across this pattern I thought it might just work, and I'm pretty happy with it. I have to admit that I did cheat a little with the back as I was a bit nervous about the zipper, and didn't have one long enough at home anyway (this was a "make-it-now-while-the-kids-nap" type project), so I played with the back a little and just used buttons and elastic loops to close the back. It worked OK. The only thing I was disappointed with was the fact that the lining and outer are joined at the bottom, and mine doesn't sit quite flat ... it's definitely my fault, and not the fault of the pattern, but I think next time I would just leave them separated from each other so there is no pulling and bubbling around the bottom edge of the dress. Otherwise, it's super cute, and the fabric matched perfectly with a little red cardigan Nanna knitted for Hannah this winter. 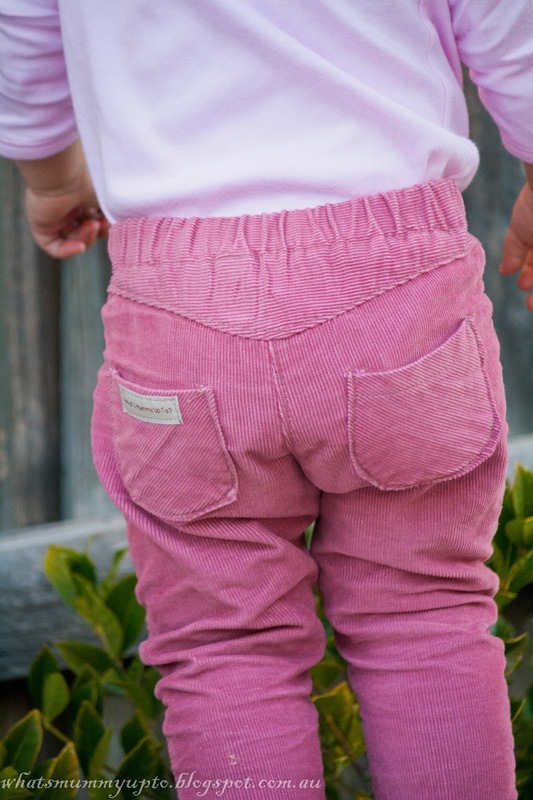 And I'm glad she's worn it a few times, 'cause this little munchkin is growing like a weed at the moment ... I think it might already be too small! 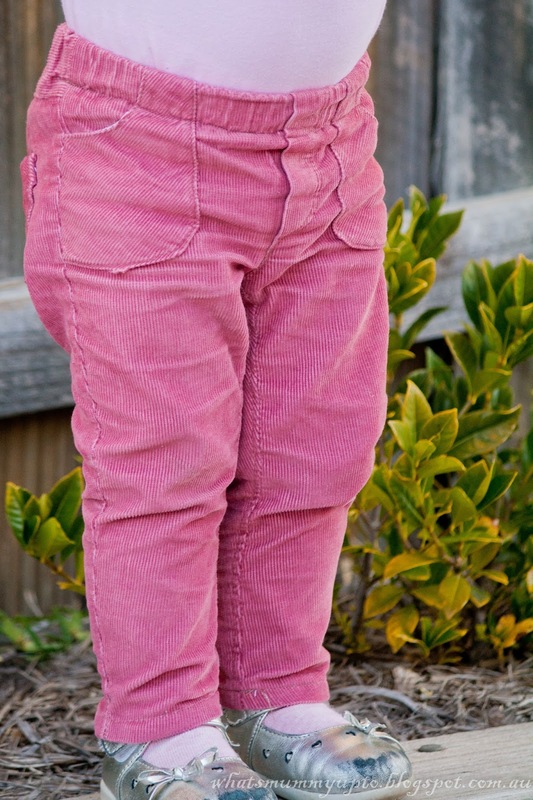 Next I was keen to try out some pants and the e cords toddler pants pattern from Running with Scissors really took my fancy. I loved how professional they look, and as Jessica offered a free 18 month size pattern, this winter was the perfect time to give it a go. I nabbed this dusty pink corduroy from Nanna's stash (thanks Nanna!!) and gave it a go. I love the little details like cutting the pockets on an angle so the corduroy lines run diagonal. Really cute! I was also stoked with how easy these came together. I was nervous about being able to get my yoke centred, and about the front fly section, but it really was super-easy! 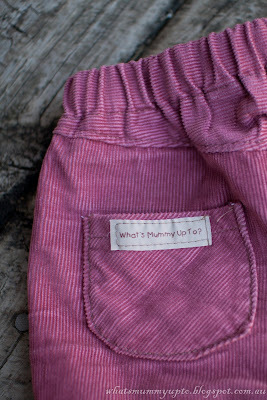 Oh, and did you notice my new clothing labels? I'm not starting a business or anything ... yet ... ha ha ... but I love that it can make a little home-made outfit like this look that little more special. 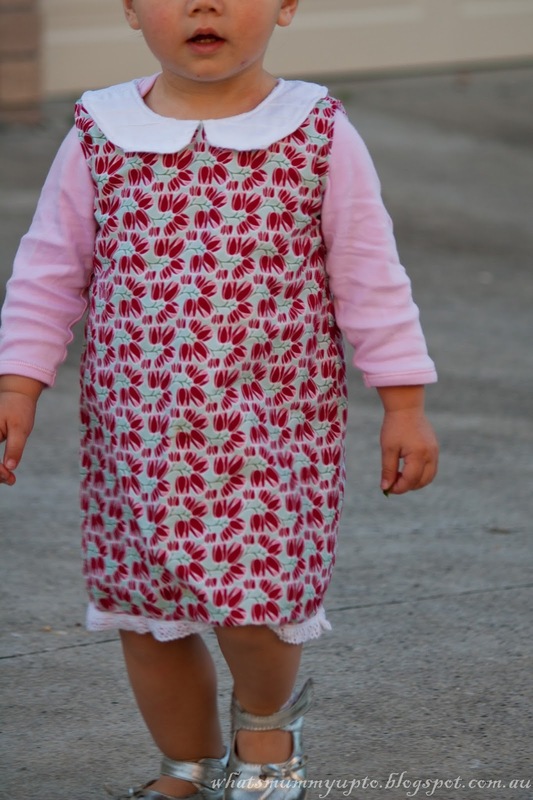 When I was a kid my Mum made me lots of clothes, and she's an amazing seamstress so they were beautiful. 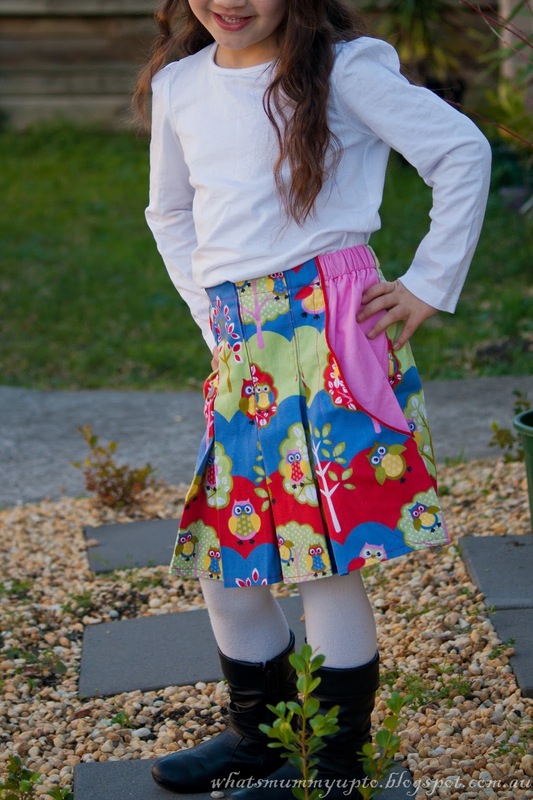 But, one of the things I really disliked as an older kid, and when trying to fit in with all the other kids, was that sometimes homemade clothes LOOKED homemade. Now there's absolutely NOTHING wrong with homemade ...at least I hope there's not, 'cause my girls wear a tonne of homemade things ... and often the girls' favourite outfits are the mummy-made ones, but if a little professional touch like this can make them feel just that little bit more professional-looking, all the better I reckon. It might even score me a few more readers ... there's nothing wrong with using your kids to advertise Mummy's blog is there?!? LOL! This cute little Babushka dress called the Montana Dress by Ivy Designs caught my eye because ... well ... I love Babushka's, but what made me download the free pattern and make this little dress on the very same day was the back. I loved it the Back-of-the-Babushka details. Now to be truthful, this is one of those projects that was probably a little bit of a waste, as Bethany is really a little too old to wear a Babushka pinafore like this ... being a big school girl and all now... and it's way big on Hannah at the moment, but I just couldn't help myself. 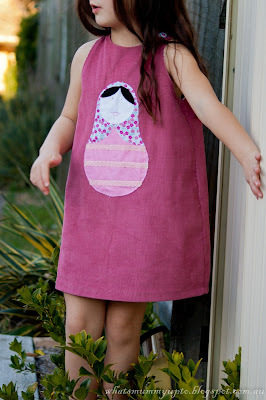 I also learned a few skills of embroidery with the babushka's face, and I can't go past a good pinafore pattern in my pattern folder. 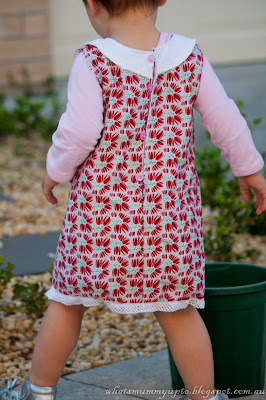 The fabric I used for this was the same pink corduroy from Nanna's stash (thanks again Nanna! ), and just some scraps for the babushka. Anyway, hopefully Hannah will be able to wear it next winter, and if not, Mummy had fun with it anyway! 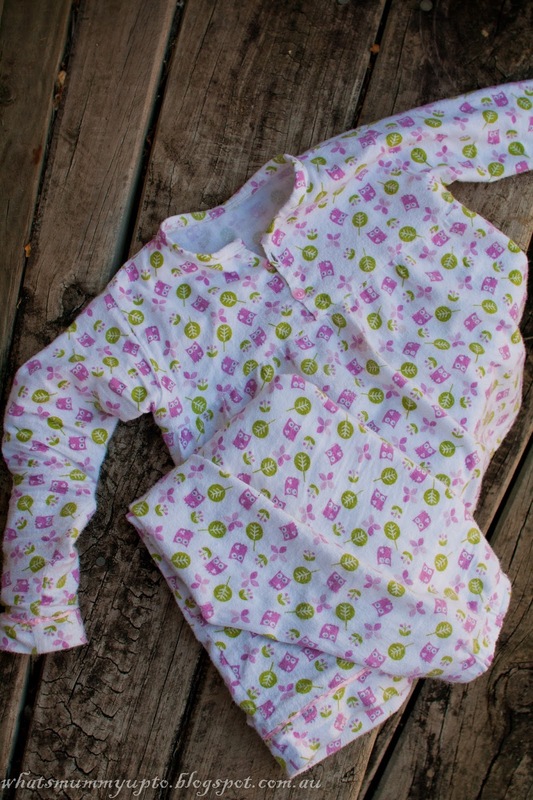 Last on my winter sewing run-down is these Hoot Winter PJ's for Bethany. This project started when I went with a friend to Newcastle (a couple of hours north of Sydney) a couple of months ago for an afternoon tea and craft workshop hosted by a lovely lady who has an Etsy store call Stash Creative Supplies. She was selling off some designer fabrics super-cheap, and I picked up this Shari Butler owl flannelette at a bargain price (along with a few other fabrics of course!!). I'm so sad to say that soon after that day, she actually changed her store a little and now doesn't sell fabrics, which is too bad, but she does have a great assortment of party supplies and other fun stuff ... she has beautiful taste! Anyway, the very next day, I bravely cut into this beautiful fabric, and managed to design and make these winter PJ's. I'm working on another pair for Hannah (to be worn next year), and will be posting a tutorial for these really soon ... so stay tuned if you're interested in getting a head start on winter PJ's for next year. This winter, I've also pulled out the hooks and yarn, and crocheted up a few items. It's mostly been hats, as I've had an absolute run of friends/family having babies, and a little handmade hat is such a lovely gift to receive. 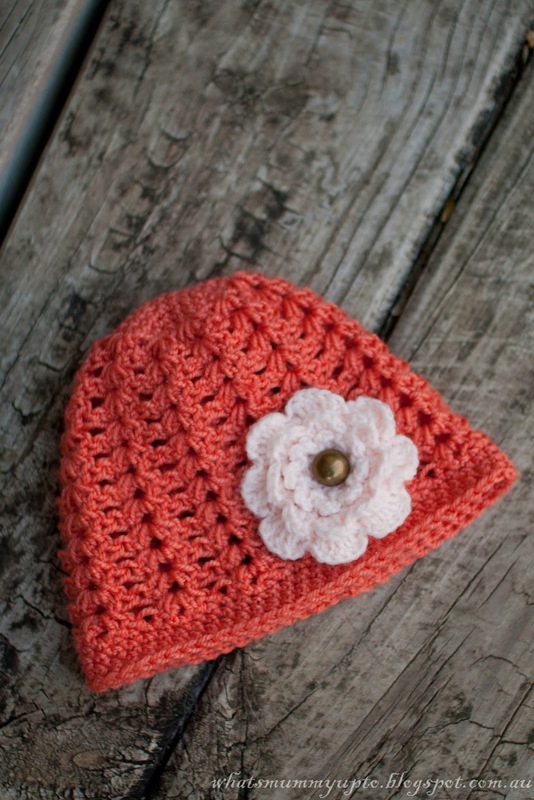 I've made a few different hats, but by far my favourite and the one I keep going back to is this one ... the Shell Stitch Beanie from the Dainty Daisy. It's reliable, really pretty and looks great in a variety of colour combinations. My favourite this year is this apricot/orange one that I made for Hannah, and she has worn so much through the cold. I coupled it with a Frothy Flower from Very Berry Handmade. So, there's the proof that this Mummy is not turning into a food blogger after-all, and that I've been having so much sewing fun this winter. I adore your creations! And the labels.... It all looks so professional. LOL Mary ... Certainly nothing wrong with food bloggers ... I am married to one afterall ... And I benefit from his food-blogging honed photography skills too!! Thanks for your kind comments! Beautiful clothes for the children! Thank you for sharing your projects and the links. I visited your blog for the first time yesterday and it's great. Thanks Joan, and thanks for reading too!